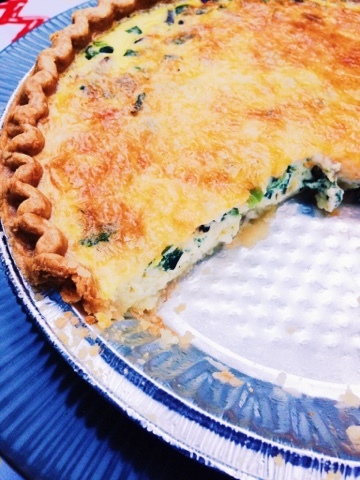 Who doesn't love a fresh out of the oven cheesy quiche? Our course this is my second time making this recipe this summer. It's so yummy that I had to share!! Preheat oven to 350F degrees. Bake the pie crust until lightly golden brown. Thaw and drain spinach. ( I did not cook my veggies this time around. However, this is optional- Place chopped onions and peppers in a skillet coated with 1 teaspoon olive oil or nonstick spray, add the garlic, and a sprinkle of salt and pepper. Turn the heat on to medium-high and sauté the onions until they release all of their moisture and no more water remains on the bottom of the skillet, about 6-7 minutes. whisk together the eggs, milk, and parmesan cheese until combined. Sprinkle with salt and pepper. Set aside. Blot and squeeze the rest of the water out of the thawed spinach. After 8 minutes, remove the pie crust from the oven and spread spinach on top. Add the cooked onions, peppers, and shredded cheeses. Pour the egg mixture on top. If desired, sprinkle the top lightly with more parmesan cheese and/or salt and pepper. Allow to cool for 5 minutes before slicing and serving. 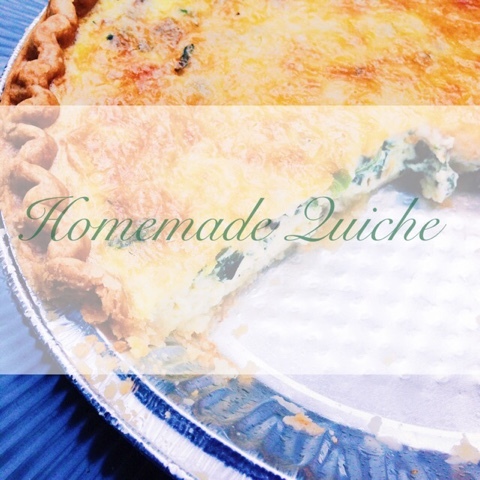 Looks yummy, I've had Quiche before but only out to eat. I'm going to have to give this recipe a try.